Sisters. Commissioned Painting. Acrylic on canvas. 30 X 38. 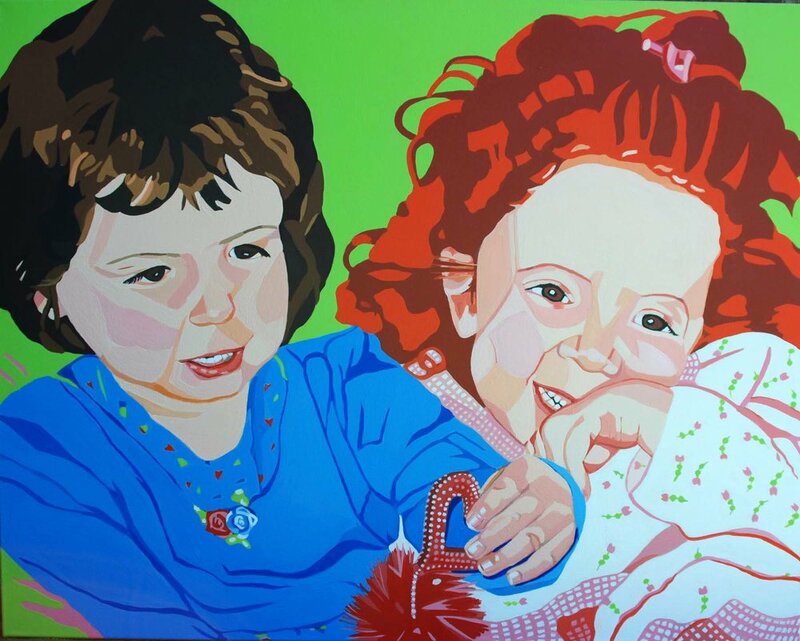 Marilyn Witkowski is an artist and illustrator specializing in realistic, yet fun portraiture. Marilyn's passion for art began in high school when she took evening painting classes at the Maryland College of Art and Design in Silver Spring, Maryland. She began to seriously consider a career as an artist when her instructor, Gustav Trois, a prominent Washington DC artist and educator, whose work is housed in the permanent collection of the Smithsonian Institution, strongly encouraged her. But after earning a BA in Studio Art from the University of Maryland College Park and moving to New York City, Marilyn's dream was sidelined when she was offered a position in display advertising at the Village Voice newspaper. This move unexpectedly led to a 25+ year career writing and producing advertising communications in NYC, and later in Washington, DC. Still, her passion for fine art continued and she studied new painting techniques whenever possible. In 1979, her work gained positive attention when, at the request of her supervisor, she displayed her paintings in the DC office where she worked. Soon, in addition to working full-time, Marilyn began painting portraits on commission in her unique painting style inspired by the leading POP artists of the sixties, described by some as "contemporary realism." In 2007, with her youngest child in high school and having survived cancer, Marilyn reevaluated her priorities, retired from the corporate world, and directed her energy into advancing her art and design skills. She returned to college to study alternative art mediums, most notably printmaking and digital drawing and was soon commissioned for new portrait paintings. Today, she uses both traditional (painting, drawing, and silkscreen) and contemporary (digital illustration and photo editing) methods to create or inform her artworks. Marilyn currently resides in sunny Delray Beach, Florida and is available for freelance projects.